These next four photos are intended to give you an overall look at the Ruger SR9 Pistol. Throughout this review, you can click on any photos to bring up a high resolution photo allowing you to see the features in greater detail. As you can see below, this model (model number 3301) of the SR9 Pistol has a brushed stainless steel slide and black polymer (glass filled nylon) frame. A couple of key features to point out are the accessory rail, ambidextrous manual safety, ambidextrous magazine catch and the trigger safety. The black sights and guide rod help to accent the stainless look of this two tone pistol. From the rear, you can see that the SR9 is a striker fired pistol (no hammer), the rear of the grip has a rubber reversible backstrap and the pistol comes with a set of highly visible three dot sights. The SR9 measured 1.27" in width at its widest point which is across the manual safety. The pistol measured 5.54" in height with the magazine installed and 7.60" in length. These measurements were very close to the 5.52" and 7.55" stated in the specifications so the difference may be due to measuring technique. The grip has a slim feel (more on this later in the review). The Ruger SR9 weighed in at 26.20 ounces empty and 34.35 ounces with 18 rounds of Hornady 135gr ammunition. The Ruger SR9 comes with a set of highly visible three dot sights. To adjust for elevation, rotate the screw in the rear sight clockwise or counterclockwise to lower or raise the sight, respectively. Note that lowering the rear sight will lower the point of impact, and raising the rear sight will raise the point of impact. To adjust for windage, after the rear sight lock screw has been loosened using a 5/64” Allen wrench, the rear sight can be drifted laterally in its dovetail on the top of the slide by tapping it with a wooden- or plastic headed hammer or similar implement. Move the rear sight in the direction you want the shot to move on the target. After the rear sight is adjusted, tighten the rear-sight lock screw. The photo below shows looking down the three dot sights. 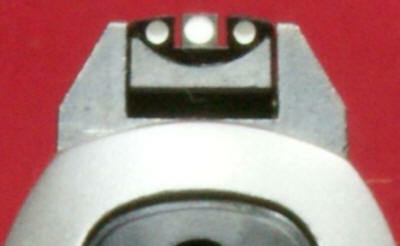 At arms length, the open gaps on each side of the front sight inside the rear sight are similar to what is shown in the photo. As my eyes continue to age, I prefer this type of white dot arrangement because I'm able to see the dots better than an all black sight arrangement. The distance between the front and rear sights measured about 6.00" on the SR9 and about 5.42" on the SR9c. This is about a 11% increase in sight radius from the SR9c. The SR series of pistols come with a "LOADED WHEN UP" indicator on the top of the slide. In these next two photos, you can see the indicator in the down "unloaded" and up "loaded" positions. When a round is chambered, the rear of the case pushes the front of the indicator up. This raised indicator gives both a visual and tactile indication that a round is in the chamber. Everyone has their own personal preference when it comes to these types of devices. For me, I take new shooters to the range all the time and prefer this highly visible "no brainer" approach when it comes to knowing the state of the pistol. The barrel measured 4.14" from the tip of the barrel to the rear of a case placed in the chamber (basically breech face). The barrel has 6 grooves and a 1:10" RH twist. When the slide is forward and the barrel is locked up, I couldn't detect any movement in the barrel at either ends. You can see that as the slide moves back, the front of the barrel tilts up similar to many pistols. The barrel is an investment casting which is made from SAE 410 (or UNS4100) stainless steel in Ruger's Pine Tree Casting facility. After the last shot is fired, the slide will be held open and the pistol is ready for a magazine swap. With a press of the magazine latch button, empty magazines drop freely out of the grip. These next several photos give you a look into the ejection port while the slide is locked open and a magazine installed. This photo helps to show how the "Loaded When Up" lever presses against the rear of the case and slides up when a round is chambered. You can also see the tip of the ejector and extractor. The lower front of the frame, below the barrel, has an accessory rail molded into the frame. Depending on how you measure this rail, it is about 1.50" long and has a single slot. The photo below also shows Ruger's warning statement "BEFORE USING GUN - READ WARNINGS IN INSTRUCTION MANUAL" along with "- AVAILABLE FREE -". The "available free" parts seems a bit much, but the text doesn't stand out too much when you are looking at the pistol. The photo below shows the SR9 with a Streamlight TLR-1 light installed on the accessory rail. The controls located on the right side of the pistol are the manual safety, magazine latch and you can see the end of the takedown pin. The right side of the slide appears to be etched with the Ruger Logo along with "RUGER PRESCOTT, AZ USA". The right side of the frame has the warning statement, serial number plate and RUGER name and logo molded into the grip. The controls located on the left side of the pistol are the manual safety, slide stop, magazine latch and the takedown pin. The left side of the slide is etched the with model name "SR9". The left side of the frame has the RUGER name and logo molded into the grip. These two photos below also show the manual safety in the up "Safe" position and then in the down "Fire" position. The left side of the pistol has colored markings that help indicate the state of the manual safety with the white being visible indicating "Safe" and red indicating "Fire". When the slide stop is engaged with the slide open, you cannot easily press down on the slide stop to release the slide. The thought is that you take your other hand and pull the slide back to release the slide during a magazine swap. Over time, this will most likely break in a little like it has done on my SR9c. Yet, you should still train yourself to release the slide with the opposite hand because under stress your fine motor skills will reduce the ability to drop the slide with your shooting hand. The right side of the pistol has no colored marking indicating the state of the manual safety and the two photos below show the right side of the pistol with the safety in each position. The Ruger SR series of centerfire pistols are all striker fired pistols. At the rear of the pistol is a striker status indicator. These next three photos show the striker in the "cocked", just prior to firing, and "uncocked" (fired) positions. The SR9 comes with a trigger safety that you can see below and also an internal firing pin block that prevent the firing pin from moving forward unless the trigger is completely pulled. For the visible trigger safety, you must press on the front part of the trigger to cause the rear part of the safety lever to raise up so that the rear of the lever will no longer bear on the frame as the trigger is pulled. The trigger pull measured 6.3 pounds based on an average of 10 pulls using a Lyman Digital Trigger Pull Gauge. The trigger has an initial take up of about 0.14" and then seems to break at about 0.28" of travel. Overall I think this pistol has a good trigger and may be slightly better than my SR9c. Since the internals of both the SR9 and SR9c are the same, variations in trigger pull weight/feel are a result of slight differences in manufacturing tolerances. The grip on the SR9 has checkering on both sides and the front of the polymer frame. Just below the trigger guard, the girth of the grip measured 5 3/8". This girth is only about 1/8" less than several other pistols I measured, but for some reason the SR9 has a slimmer feel which is probably due to the thinned area on the grip where the "Ruger" name is molded. For my hand size (9" girth palm and 3.5" long middle fingers), the SR9 grip has a good feel. The SR9 comes with a reversible rubber backstrap. In the photos shown, the backstrap is shown in its bulging configuration. With the backstrap reversed, it has no bulge and only produces a flat rubber textured ribbed area. The backstrap can be removed by pressing out the pin with a paper clip or small punch. The backstrap is removed by pushing it towards the bottom of the grip. The backstrap is an all rubber piece and has s steel bushing (not visible) in the lower slotted area. These next two photos show the backstrap installed in the low profile (not bulging) configuration. The bottom of the Ruger magazines have the "RUGER" name along with the Ruger Logo molded into the magazine floorplate. This photo below also gives you a view at how the reversible backstrap slips inside a slot on the rear of the grip. It is hard to tell in the photo below, but there is a very slight tapper on the front of the magazine well. Other than this front surface, all other magazine well sides were straight with no tapper. If you look through the magazine well at the lower left side, you can see the tip of the magazine disconnect. When a magazine is removed, the firing pin is blocked from impacting the primer when the trigger is pulled. The Ruger SR9 comes with two 17-round steel magazines . These magazines are manufactured in Italy by Mec-Gar who makes quality magazines for a wide range of firearms manufacturers. The magazines are drilled on each side to indicate the number of rounds loaded. As you load rounds in the magazine, the rounds will cover holes drilled in the sides of the magazine. Below you can see that the 17 hole now looks shiny which means all 17 rounds are double stacked inside the magazine. When you consider the manual safety, trigger safety, striker blocker, magazine disconnect and loaded chamber indicator, clearly Ruger puts a lot of effort into producing a safe product. Each person will have their own opinion on what safety option is needed for their own particular preference and situation. For me, I generally like these added features. I was also pleased to see that the trigger on this particular SR9 was slightly better than my SR9c which I already liked. For more detailed photos and commentary, make sure you check out the other parts of this review and feel free to leave comments on my Reader's Comments page. The following links are provided to help you see other parts of this review.